Welcome to week 2 of a study from Let's Talk About Ministries "Living in relationship with Jesus" series. This 8 week study will follow Paul's letters to the Thessalonians. When we know God we want to share him and that is what Jesus commissioned us to do. To share the good news of the Gospel with others. To live in a way that points to God, making people curious and ultimately wanting God in their life too. Paul travelled, sharing the Gospel message as he went from one place to another, but his ministry was not just sharing the message of Jesus. We cannot share the message of Jesus and then walk away, we are to make disciples. Paul stayed with people and shared his life with them. He came to care about them deeply. He says toward the end of this chapter that he is longing to get back to them. I have recently had someone stay with me who is in minstry and has been for many years. We have had many Skype conversations as she has shared her expertise, taught me and helped me grow. When she came to stay here she continued to do those things but as we spent time together we shared personally as well as professionally. We considered ourselves friends even though an ocean separated us, and yet during that stay something changed and we became good friends. Paul did not make believers, he made friends which he continued to teach and grow. That is the basis of his letters; he is encouraging, teaching and rebuking when necessary so that they will grow in their faith in order to be equipped. If we only ever speak the Gospel then faith will not grow and lives will not be transformed. In Matthew 22, Jesus responds to the Pharisees question about the greatest commandment, telling them that it is to love God and then love one another. The Thessalonians would have learned as much about the Gospel of Jesus by watching the way in which Paul lived as they did from hearing him speak. 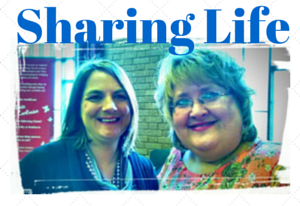 As you seek to share the Gospel with your unbeliving friends, are you sharing life with them? Are you loving them? Do you burden them with the message or do they delight in your company? Sharing your love of Jesus means sharing your life, are you ready for that kind of commitment? Are you prepared for the time it takes to love and encourage another person? Paul stayed with them, worked hard and continued to encourage even when he could not be there in person. Is there someone in your life who needs to know Jesus? How can you invest a more time into loving and encouraging them? Tania, I came to your blog after you first chose to invest time over at mine. And this is the post that greets me. How perfect. We don't know each other, but you blessed me today by choosing to offer encouragement and affirmation and giving your time to my words. Sharing your life, even when it is "just" done over the bits and bytes sent through the airwaves (or whatever it is ... technology is not my thing :) ) is powerful. Thank you for this reminder and admonition of Paul. And thank you for living it out for others to see. It does take time and effort, but the time invested is eternal! You are very wise in your observation of Paul and his interaction with the believers he fostered. Lots of wisdom in this post - consider it tweeted!